Mouse anti Human CD66e antibody, clone C365D3 (MCA1744) used for the evaluation of CD66e exppression on PaCa 5061 cells by flow cytometry. Immunostaining and cell surface expression of epithelial/pancreatic markers and overexpressed proteins in PaCa 5061 cells. FACS profiles of PaCa 5061 cells. Cell surface expression of CD44, EpCAM, EGFR, CEACAM1, CEACAM5 and CEACAM6 were obtained with specific antibodies as in materials and methods. Each histogram shows cell surface expression of the corresponding marker (filled curves) and the irrelevant, isotype-matched antibody (open curves). From: Kalinina T, Güngör C, Thieltges S, Möller-Krull M, Penas EM, Wicklein D, Streichert T, Schumacher U, Kalinin V, Simon R, Otto B, Dierlamm J, Schwarzenbach H, Effenberger KE, Bockhorn M, Izbicki JR, Yekebas EF. BMC Cancer. 2010 Jun 16;10:295. Mouse anti Human CD66e antibody, clone C365D3 (NCRC23) recognizes human Carcinoembryonic antigen-related cell adhesion molecule 5, also known as CD66e, carcinoembryonic antigen, Meconium antigen 100, CEA or CEACAM5. CD66e is a 702 amino acid ~77 kDa GPI anchored membrane protein containing 7 Ig-like domains. 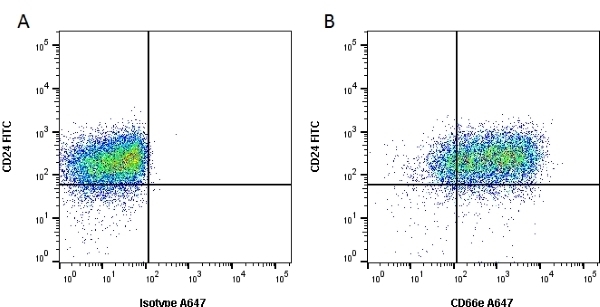 Mouse anti Human CD66e antibody, clone C365D3 does not cross-react with normal cross-reacting antigen (CD66c), or with biliary glycoprotein 1 (CD66a) as indicated by binding assays (Price 1988, note: in this study Mouse anti Human CD66e antibody, clone C365D3 is designated as clone 6 (from author)). Spleen cells from immunised BALB/c mice were fused with cells of the mouse P3NSI myeloma cell line. This product is photosensitive and should be protected from the light. Should this product contain a precipitate we recommend microcentrifugation before use. Seth, J. et al. (1988) Carcinoembryonic antigen. Soucek, K. et al. (2010) Fetal colon cell line FHC exhibits tumorigenic phenotype, complex karyotype, and TP53 gene mutation. Cancer Genet Cytogenet. 197: 107-16. Kalinina, T. et al. (2010) Establishment and characterization of a new human pancreatic adenocarcinoma cell line with high metastatic potential to the lung. Dallas, M.R. et al. (2012) Divergent roles of CD44 and carcinoembryonic antigen in colon cancer metastasis. Stern-Ginossar. N. et al. (2007) Intercellular Transfer of Carcinoembryonic Antigen from Tumor Cells to NK Cells. J Immunol. 2007 Oct 1;1 79: 4424-34. Ferro, F. et al. (2011) Adipose tissue-derived stem cell in vitro differentiation in a three-dimensional dental bud structure. Chao, A. et al. (2006) Molecular characterization of adenocarcinoma and squamous carcinoma of the uterine cervix using microarray analysis of gene expression. Int J Cancer. 119: 91-8. Domenis, R. et al. (2015) Adipose tissue derived stem cells: in vitro and in vivo analysis of a standard and three commercially available cell-assisted lipotransfer techniques. Stem Cell Res Ther. 6: 2. Wicklein, D. et al. (2018) CEACAM1 promotes melanoma metastasis and is involved in the regulation of the EMT associated gene network in melanoma cells. Sci Rep. 8 (1): 11893.